Rio Grande’s Will Hill had a game-high 32 points, six assists and three steals in Saturday afternoon’s 94-80 loss to West Virginia University-Tech. CHARLESTON, W.Va. — Thomas Collins and Brandon Shingles fueled a key second half run and scored 29 of their combined 35 points after halftime, lifting host West Virginia University Tech to a 94-80 win over the University of Rio Grande, Saturday afternoon, in River States Conference men’s basketball action at the Charleston Catholic Athletic Complex. The Golden Bears snapped a four-game losing slide, improving to 10-8 overall and 4-3 in league play with the victory. Rio Grande suffered a third straight loss – all in conference play – and dropped to 7-12 overall and 2-5 in the RSC. The RedStorm led by as many as nine points in the first half before Tech rallied to forge a 38-38 deadlock at the intermission. The game was still tied at 43-all following a bucket by Rio junior Abe Eze (Lagos, Nigeria) with 17:57 left to play, but the Golden Bears reeled off 12 of the game’s next 14 points and never looked back. Collins scored 16 of his team-high 22 points in the second half and was responsible for four points in the game-changing spurt. Shingles, who had all of his 13 points after halftime, scored five points in the run. Rio Grande got no closer than seven points on two occasions the rest of the way – the last of which came at 76-69 following a jumper by sophomore Stanley Christian (Norfolk, VA) with 5:30 remaining – but Tech responded with another 9-1 run over the next two minutes to build a 15-point lead and settle the issue once and for all. The Golden Bears shot a sizzling 63 percent from the field in the second half (17-for-27) and were also 17-for-22 at the free throw line (77.3%) after the break. 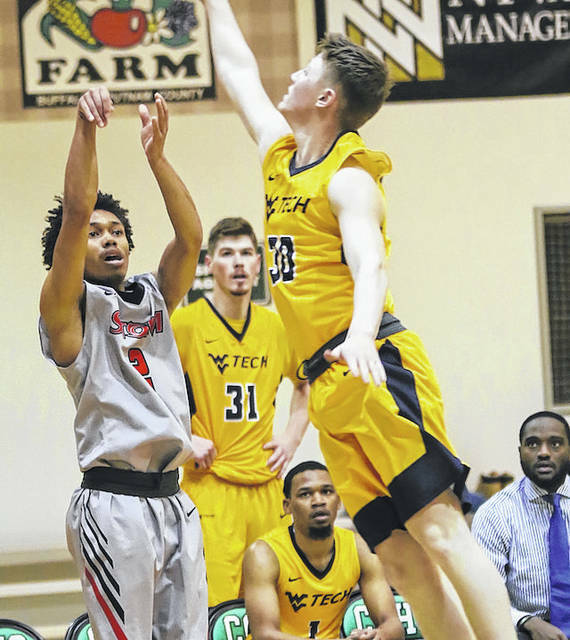 Tech had three other double-digit scorers in Michael Scott (15), Dominik King (13) and Tamon Scruggs (12). Scott finished with a game-high eight rebounds and King handed out a team-best four assists. Rio Grande was led by senior Will Hill (Worthington, OH), who had his best performance in his three games since returning from an emergency appendectomy, with a game-high 32 points, six assists and three steals. He connected on seven three-point goals. Sophomore Greg Wallace (Montego Bay, Jamaica) and freshman Jaxon Burgess (Louisville, KY) added 13 and 10 points, respectively, in a losing cause for the RedStorm, while Eze had a team-best six rebounds. Rio Grande shot just 38.6 percent (22-for-57) from the field and was out rebounded 39-27. The RedStorm are scheduled to return to action on Tuesday night, hosting Alice Lloyd College in another RSC contest. Tipoff is set for 7:30 p.m.